C. Curiatius Trigeminus filius was one of the moneyers for the year 135 BC. He is probably the son of C. Curiatius Trigeminus, moneyer for 142 BC. 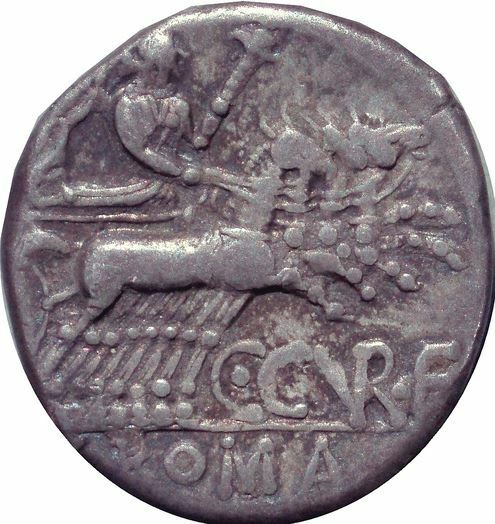 Gens Curiatia was a distinguished family at Rome, with both patrician and plebeian branches. Members of this gens are mentioned in connection with the reign of Tullus Hostilius, the third King of Rome, during the seventh century BC. The first of the Curiatii to attain any significant office was Publius Curiatius Fistus, surnamed Trigeminus, who held the consulship in 453 BC. The gens continued to exist throughout the Republic, and perhaps into imperial times, but seldom did its members achieve any prominence. The most common cognomen of the gens in the times of the Republic is Fistus. The consul of 453 bore the additional surname Trigeminus, which can best be translated as "triplet."